VHS recorder, camcorder and cassette. VHS (short for Video Home System) is a standard for consumer-level analog video recording on tape cassettes. Developed by Victor Company of Japan (JVC) in the early 1970s, it was released in Japan on September 9, 1976 and in the United States on August 23, 1977. Optical disc formats later began to offer better quality than analog consumer video tape such as VHS and S-VHS. The earliest of these formats, LaserDisc, was not widely adopted. However, after the introduction of the DVD format in 1997, VHS's market share began to decline. By 2008, DVD had replaced VHS as the preferred low-end method of distribution. The last known company in the world to manufacture VHS equipment, Funai of Japan, ceased production in July 2016. In 1969, JVC collaborated with Sony Corporation and Matsushita Electric (Matsushita was then parent company of Panasonic and is now known by that name, also majority stockholder of JVC until 2008) in building a video recording standard for the Japanese consumer. The effort produced the U-matic format in 1971, which was the first format to become a unified standard. U-matic was successful in business and some broadcast applications (such as electronic news-gathering), but due to cost and limited recording time very few of the machines were sold for home use. In early 1972, the commercial video recording industry in Japan took a financial hit. JVC cut its budgets and restructured its video division, shelving the VHS project. However, despite the lack of funding, Takano and Shiraishi continued to work on the project in secret. By 1973 the two engineers had produced a functional prototype. Matsushita's backing of JVC persuaded Hitachi, Mitsubishi, and Sharp to back the VHS standard as well. Sony's release of its Betamax unit to the Japanese market in 1975 placed further pressure on the MITI to side with the company. However, the collaboration of JVC and its partners was much stronger, and eventually led the MITI to drop its push for an industry standard. JVC released the first VHS machines in Japan in late 1976, and in the United States in mid 1977. JVC HR-3300U VIDSTAR – the United States version of the JVC HR-3300. It is virtually identical to the Japan version. Japan's version showed the "Victor" name, and didn't use the "VIDSTAR" name. 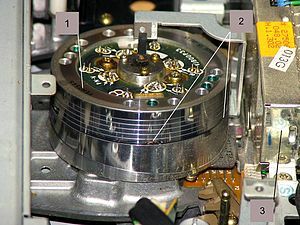 The interior of a modern VHS VCR showing the drum and tape. 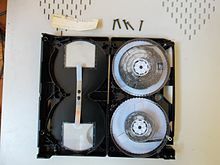 A close-up process of how the magnetic tape in a VHS cassette is being pulled from the cassette shell to the head drum of the VCR. 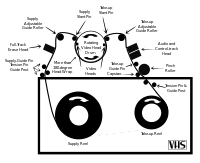 This illustration demonstrates the helical wrap of the tape around the head drum, and shows the points where the video, audio and control tracks are recorded. Panasonic Hi-Fi 6-head drum VEH0548 installed on G mechanism as an example, demonstrated a typical VHS head drum containing two tape heads. (1) is the upper head, (2) is the tape heads, and (3) is the head amplifier. The upper- and underside of a typical 4-head VHS head assembly showing the head chips. A typical RCA (Model CC-4371) Full-Size VHS Camcorder with a built-in three-inch color LCD screen. The tiltable LCD screen is rare on full-size VHS camcorders; only the smaller VHS-C camcorders are more common to have a tiltable LCD screen on some units. In the original VHS specification, audio was recorded as baseband in a single linear track, at the upper edge of the tape, similar to how an audio compact cassette operates. The recorded frequency range was dependent on the linear tape speed. For the VHS SP mode, which already uses a lower tape speed than the compact cassette, this resulted in a mediocre frequency response of roughly 100 Hz to 10 kHz for NTSC, frequency response for PAL VHS with its lower standard tape speed was somewhat worse. The signal-to-noise ratio (SNR) was an acceptable 42 dB. Both parameters degraded significantly with VHS's longer play modes, with EP/NTSC frequency response peaking at 4 kHz. Victor S-VHS (left) and S-VHS-C (right). Size comparison between Betamax (top) and VHS (bottom) videocassettes. A Rasputin Music retailer (Fresno, CA) selling used VHS cassettes for $1 each for people who still have working VCRs. Though 94.5 million Americans still owned VHS format VCRs in 2005, market share continued to drop. 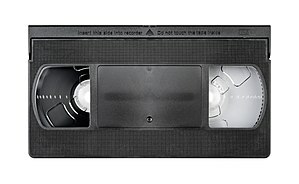 In the mid-2000s, several retail chains in the United States and Europe announced they would stop selling VHS equipment. In the U.S., no major brick-and-mortar retailers stock VHS home-video releases, focusing only on DVD and Blu-ray media. Independent and non-profit retail stores like Rasputin Music, Goodwill, and The Salvation Army sell used VHSs in bargains, and some public libraries giving away their weeded VHS collections for free. A badly molded VHS tape. Mold can prevent modern use. See Media preservation. However, there have been a few exceptions. For example, The House of the Devil was released on VHS in 2010 as an Amazon-exclusive deal, in keeping with the film's intent to mimic 1980s horror films. The horror film V/H/S/2 was released as a combo in North America that included a VHS tape in addition to a Blu-ray and a DVD copy on September 24, 2013. The DVD-Video format was introduced first on November 1, 1996 in Japan to the United States on March 26, 1997 (test marketed) and mid-late 1998 in Europe and Australia. The 2013 documentary film Rewind This! directed by Josh Johnson, tracks the impact of VHS on film industry through various filmmakers and collectors. ^ a b c "Parting Words For VHS Tapes, Soon to Be Gone With the Rewind". The Washington Post. August 28, 2005. Retrieved November 18, 2018. ^ a b [ "VHS era is winding down". The Los Angeles Times. ^ a b Walton, Mark (July 21, 2016). "Last known VCR maker stops production, 40 years after VHS format launch". Ars Technica. Archived from the original on May 22, 2017. Retrieved May 22, 2017. ^ "AMPEX VRX-1000 – The First Commercial Videotape Recorder in 1956". CED Magic. Retrieved March 24, 2013. ^ The History of Television 1942-2000, pg 169. Albert Abramson. 2003. ISBN 9780786432431. Retrieved March 24, 2013. ^ "VCR". Ce.org. Archived from the original on August 13, 2006. Retrieved July 11, 2011. ^ Pollack, Andrew (January 20, 1992). "Shizuo Takano, 68, an Engineer Who Developed VHS Recorders". The New York Times. Retrieved July 11, 2011. ^ a b c d "VHS STORY – Home Taping Comes of Age". Rickmaybury.com. September 7, 1976. Archived from the original on July 19, 2011. Retrieved July 11, 2011. ^ Bylund, Anders (January 4, 2010). "The format wars: of lasers and (creative) destruction". Arstechnica.com. Retrieved July 11, 2011. ^ a b c d e 100 Greatest Inventions. Citadel Press Books. 2003. pp. 288–289. ISBN 9780806524047. Retrieved October 6, 2012. ^ De Atley, Richard (September 7, 1985). "VCRs put entertainment industry into fast-forward frenzy". The Free Lance-Star. Associated Press. pp. 12-TV. Retrieved January 25, 2015. ^ Elliott, Amy-Mae (October 28, 2008). "JVC last to stop production of standalone VHS players". Archived from the original on September 19, 2010. Retrieved October 31, 2008. 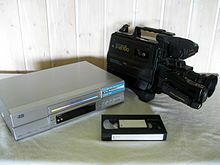 Wikimedia Commons has media related to VHS. This page was last edited on 18 April 2019, at 01:21 (UTC).